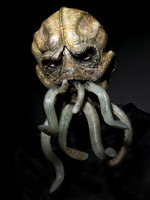 I've seen people dress up as cultists, zombies, and evil conjurers before, but Cthulhu? Enter the site Propnomicon to satisfy your Elder God craving. The blog, which has been around since 2007, was initially created for Call of Cthulhu players. With its three-dimensional focus, it's a perfect fit for fans of Cthulhu Live or anyone who enjoys H.P. Lovecraft. The labels on the right-hand side of the blog make it easy to navigate, and there are a lot of interesting topics to explore like Costuming, Arkham Sanitarium, and Miskatonic University. The majority of the site focuses on the creation or display of two- and three-dimensional props, costumes, masks, and the occasional movie set or two. If the stars in your neighborhood haven't aligned by the time you're done perusing the site, check out Propnomicon's list of Lovecraft-related recommendations for more Mythos.